We went zip lining in El Yunque, the rainforest on the island. It was a great experience! First of all, we were greeted, instructed and guided by two very knowledgeable and funny guides who not only knew zip lining but had master's degrees in biology and geology - we completed 5 zip lines, one repel and hiked In the rain forest for several miles. The zip lining tour was 3 hours in total. I volunteered to be the first of our group of 7 to take the plunge, so I jumped up on my first platform - harness securely fastened - the guide attached me to the line and off I went! I was soaring over the trees and taking in breathtaking views of the forest! The zip lining was not scary at all - I simply set down in my harness and let the equipment do its thing - I even went hands free a few times - just dangling there! It was actually peaceful! I didn't zip quite as fast as I thought I would but this adventure was more about the view of the beautiful trees, flowers and plants than the quickness of my zip line! We zip lined into the rain forest and through it, hiking along the way. The guides stopped and explained some of the trees, rocks and insects. We saw a snail eating a mango and I held a millipede. It appropriately rained in the rain forest during our tour but that didn't prohibit us from zipping! After the tour, we drove to the reserve and saw a beautiful 85 ft waterfall, La Coca Falls and did some more sightseeing in the rain forest - everything was beautiful! I particularly liked the bright colored flowers throughout. There are no big predators in the rain forest - no cats or monkeys - lots of birds, insects and such. We ended our day back in Arroyo where we walked out the back door of the apartment where we are staying and onto the beach for some relaxation! We hit up another local restaurant for dinner and tried the local specialty, mofongo rellenos - mashed plantains filled with your choice of meat and sauce - we got shrimp and steak. The plantains are not super flavorful so the garlic sauce poured over the dish helped give it was taste. It was an excellent meal enjoyed in a restaurant that sat right on the water! 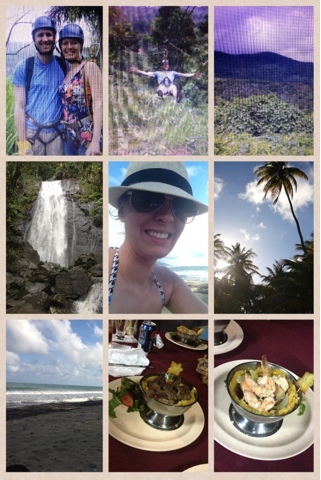 If only everyday of my life could be like this day - adventure followed by relaxation and good food = perfection!